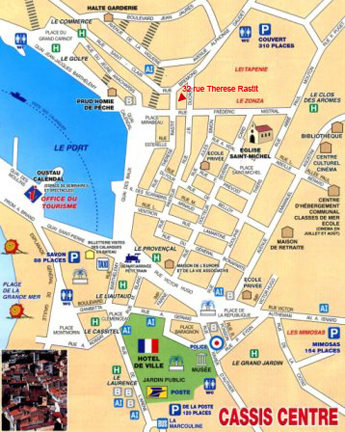 You will be tendered to the center of Cassis. Cassis was a very ancient fishing port and is an interesting village to visit. The village was rebuilt on the old ruins in the 18th century, resulting in a more regular layout than most other medieval villages. A walk through the old village streets will reveal some quaint old buildings, some dating back to the 16th century, and some restored with the colorful pastels of Provence. Other sites in the village are old fountains and an open-air artists market. The harbor area is really the prettiest part of Cassis. Portside posing and drinking aside, there's not much to do except sunbathing and look up at the ruins of the town's medieval castle , built in 1381 and refurbished by Monsieur Michelin, the authoritarian boss of the family tires and guides firm. The favored lazy pastime, though, is to take a boat trip to the calanques - long, narrow, deep fjord-like inlets that have cut into the limestone cliffs. Several companies operate from the port but check if they let you off or just tour in and out, and be prepared for rough seas. If you're feeling energetic, you can take the well-marked footpath from the route des Calanques behind the western beach; it's about ninety minutes' walk to the furthest and best calanque , En Vau , where you can climb down rocks to the shore. Intrepid pine trees find root-holds, and sunbathers find ledges on the chaotic white cliffs. The water is deep blue and swimming between the vertical cliffs is an experience not to be missed. An outdoor artists' market lets visitors buy unique paintings. Many of the shops in Cassis are little boutiques selling local handcrafts.